The Gartner Data & Analytics Summit is always a highlight of my year. It’s an opportunity to interact with industry experts, thought leaders, and professionals tasked with improving analytics at their companies. This year didn’t disappoint. On a personal level, I thoroughly enjoyed the presentations I took part in (more on that in a bit). And the circus-themed networking session brought the perfect amount of excitement and mystique to liven things up. Speaking more broadly, it was gratifying to see key themes we’re finding in the marketplace reinforced by the Summit’s presenters and attendees. Now more than ever, an increasing amount of analytics vendors are proponents of AI, and they’re discussing topics like natural language generation, machine learning, and augmented analytics. With everyone talking about these concepts, it can be challenging to understand the specifics. What is true machine learning versus marketing jargon? What is augmented analytics capable of today? And how can you be sure that business intelligence tools are analyzing your data accurately? Here’s my take on these conversations. 1. Everyone is talking about augmented analytics. 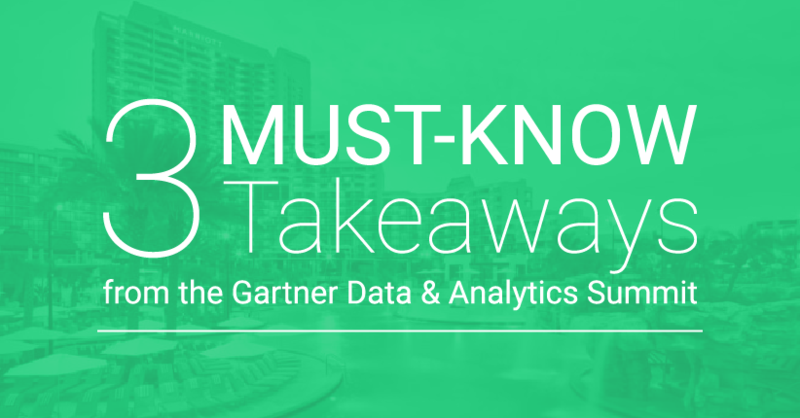 Every year, Gartner hosts a Showfloor Showdown, in which they invite six vendors to analyze a real-world problem using pre-defined data sources. We were honored that Gartner selected AnswerRocket this year. Our assignment was to analyze technology’s impact on loneliness. We were given two weeks to work with the data and build a presentation showcasing AnswerRocket to a room of spectators. I was thrilled to show our own approach to data— augmented analytics. Augmented analytics refers to the combination of machine learning and natural language generation to automate insights. Simply put, an augmented analytics platform analyzes your data to understand how your data points relate to each other; then, it explains those relationships in the form of insights written in plain English. Augmented analytics is an innovative, disruptive approach to business intelligence. AnswerRocket has been using augmented analytics from the beginning, but this year’s summit demonstrated that the topic is on fire — in keynote talks, in our booth conversations, and in the Showfloor Showdown, we kept hearing about it. From our perspective, augmented analytics is most effective when it fully understands the story in your data. That means augmented analytics platforms (like AnswerRocket) should pinpoint complex connections in your data and explain them thoroughly, as a complete narrative. For our Showfloor Showdown, we didn’t just point out trends between technology and loneliness but dove deeper into the drivers behind the data (location in US states and education level, for example, impacted the survey metrics in ways that weren’t apparent on the data’s surface). Learn more about augmented analytics. 2. The market is moving in the direction of machine learning. In this discussion, I described how machine learning can generate real impact for a company’s bottom-line by helping professionals understand what’s going on in their business data and act on the information they learn. Based on the follow-ups I received from my theater session, many attendees were curious about the different ways AI can be used for analytics. This theme remained consistent throughout the Summit. Svetlana Sicular, VP analyst at Gartner, also discussed the importance of understanding the true capabilities of AI in her talk “Ask the Expert: How to Separate Reality from AI Hype” (a talk so popular that it warranted two sessions). In her expertise, she stressed asking the right questions of vendors promoting their AI capabilities. In our experience, one of the most important considerations about machine learning in analytics software is whether the solution is open or proprietary. Proprietary platforms protect machine learning algorithms, whereas open platforms provide transparency into the algorithms (and to a larger extent, they show how your data is being analyzed). There’s no secret sauce when it comes to machine learning algorithms; these algorithms are widely available for those who look for them. That’s why AnswerRocket is an open platform. With AnswerRocket, you can invoke gradient boosting algorithms and AI libraries like scikit-learn. Our open extensibility means that technical teams can write their own extensions to leverage machine learning for the unique needs of your business. AnswerRocket also prepackages extensions that are relevant to specific industries, so non-technical teams are also equipped with the advanced insights that machine learning provides. Understand the basics of machine learning in business intelligence. 3. Businesses need to trust their analytics platforms, but accurate answers start with the data itself. Everyone wants to make data-driven decisions. But data is complex. Modern analytics software seek to analyze data and provide users with actionable insights. This automation is efficient, and these tools can be tailored to non-technical users instead of data scientists. However, when analytics platforms manage the heavy data lifting, your company must put its trust into a machine. User friendly interfaces can further obscure the back-end data processing. What you see is the answer to your question, but how do you know the data is right? This is the question we kept hearing in our booth conversations. I found it apt that the mind reader we brought to our booth to liven up the circus-themed night related AI to magic. For many business users, that’s how AI can feel. While fun for mind reading tricks, understanding how AI and analytics are analyzing business data is important for building trust in your solution. It’s critical that data-driven businesses trust their data and analytics software, which means companies need to have conversations about their current data structures on the front-end of implementation. Good analytics providers will strive for diligence in preparing your data to return accurate answers. Learn more about AnswerRocket’s open extensibility. I hope you left the Gartner Summit with as many insights as I did. Even with all these takeaways, I still want to learn more. Primarily, I want to know about your business. Just as I discussed in our case study presentation, “How EMC Insurance Accelerated Root Cause Analysis with Advanced Analytics,” AnswerRocket helps businesses understand the drivers in their data. EMC Insurance is one of the country’s largest and most highly rated insurance entities, and as Van McNeal, AVP of Strategic Analytics, explained in our session, AnswerRocket delivered bottom-line results. Sign up below to schedule a custom demo of AnswerRocket; we’ll show you how our platform can help your business better understand your data.